As the number of reported cases of the recent Ebola virus outbreak is continuously rising, so is the concern of the people and public officials about the possible duration and severity of the deadly epidemic. 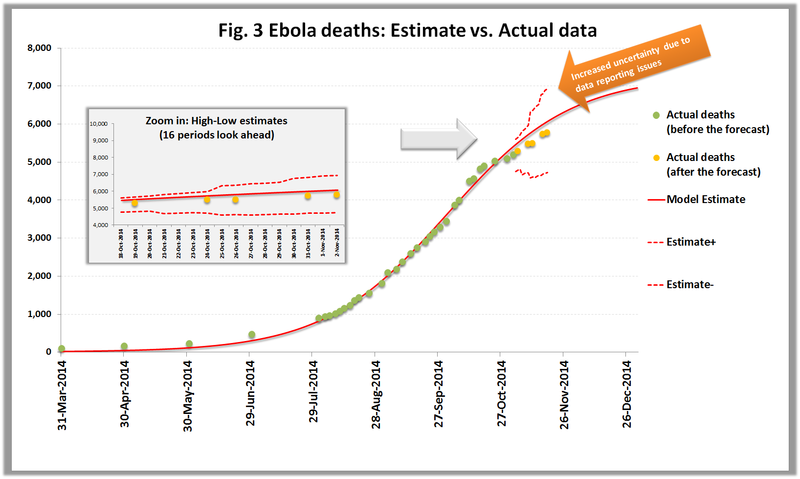 In order to estimate the evolution of the disease, we used the s-curve model and publicly available data of either confirmed or suspected Ebola cases and deaths from March to November 2014. According to the generated forecast by the model, based on actual data up to Nov 2nd 2014, the epidemic is now (Nov 18th) 76% complete (see Fig. 2) and the total number of reported victims is expected to increase an additional 22% by the end of 2014 (see Fig. 1). 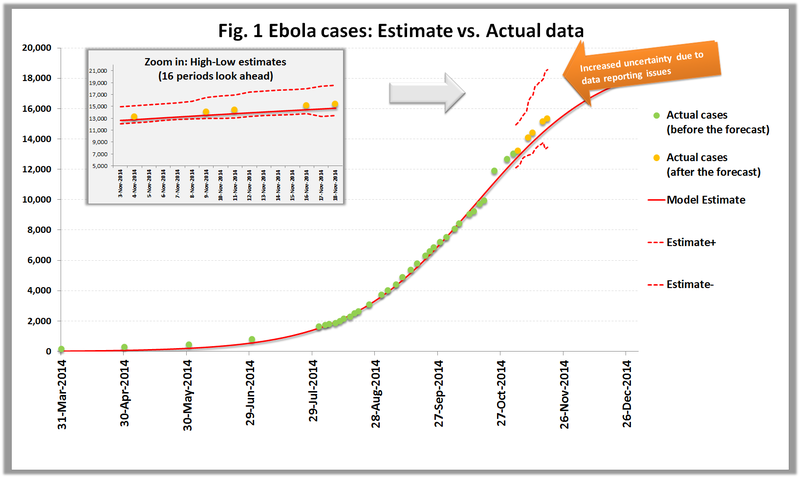 As it was forecasted, the disease exceeded 10000 reported cases in October and 15000 cases in November (see Fig.1), making this the most severe Ebola outbreak ever. Although, we had anticipated a high forecast uncertainty (see Fig 1, Zoom in window), for the selected forecast window from Nov 3rd to Nov 18th, due to data reporting issues, it turned out that the estimate was much closer to actual figures than expected. The new forecast gives higher cases estimates as compared to the previous forecast, based on data up to Oct 17th 2014, mainly due to the aforementioned data reporting discrepancy and not because of a trend change. However, as with the previous forecast, the epidemic is expected to be more than 90% complete by the end of 2014. 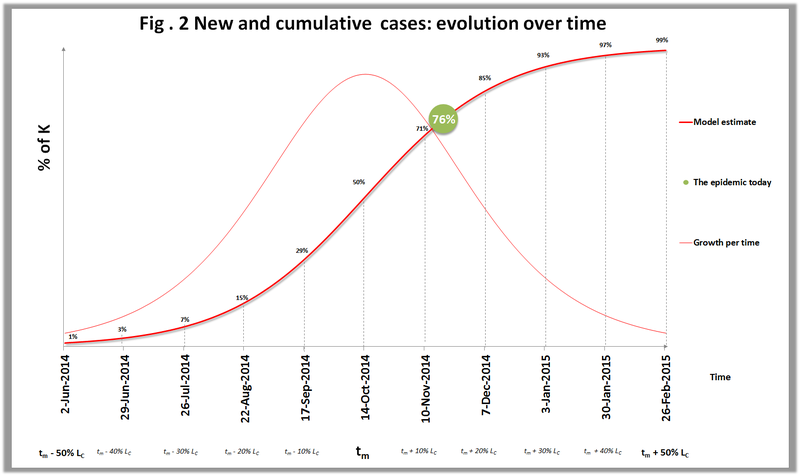 The number of Ebola deaths unveils a similar pattern as reported cases (see Fig.3), having passed to the last quarter of its “lifecycle”. Compared to the previous forecast, there is a decrease in the estimated number of deaths again as a result of data reporting discrepancies and not of a changing trend. The mortality rate (see Fig. 4), shows improvement, which probably is the result of the data reporting issues mentioned before and not of a definite changing trend. Obviously, there is a lot of uncertainty related to this forecast. First, the forecast only covers the outbreak in Africa, where almost all of the cases occur today. If contamination leaks to other countries, then the total number of victims could increase dramatically. Second, the quality of data, has been questioned, due to the poor recording processes in the infected African countries. This is especially true for cases and deaths reported after the middle of Oct when figures started to “jump” up and down abnormally due to reporting restates. Finally, this estimate is based on current health procedures and safety measures. Any improvement, especially, in the less developed countries, could significantly slowdown the progression of the disease. Despite the aforementioned uncertainty, so far, the forecast turned out quite accurate and within the predicted min-max range, with less than 5% average error for cases and deaths and 8% for mortality rates. Overall, the epidemic has already passed to the last quarter of its estimated “lifecycle” and it is expected to be practically completed by the end of 2014, albeit with great casualties and surely many concerns about our resilience to severe epidemics, especially in less developed countries. -For the reported Ebola cases, click here. -For the reported Ebola deaths, click here. -For the expected mortality rate, click here. Although the forecast performed quite well until Oct 17th, afterwards, actual figures started to deviate significantly and surprisingly from the estimates ones. A closer look in actual reported Ebola cases and deaths unveils the true cause of this uncertainty. In two words: “reporting issues”. The figures released by the WHO and gathered by local authorities are merely reported data, not necessarily depicting the actual course of the outbreak. For instance, accumulated reported deaths, which should by definition rise or at least stay the same, surprisingly declined from 5026 on Oct 24th to 4950 on Nov 4th. In just a few days the official figure for Nov 4th was corrected to 5275. Quite the opposite happened with the reported number of Ebola incidents that abnormally increased by a few thousands after Oct 19th. According to health officials this discrepancy is mainly attributed to two reasons: first because many newly reported incidents or deaths actually happened before the reporting date and second, because the poor reporting mechanisms of the infected countries may miss two times as many actual incidents and deaths compared to the officially reported figures. 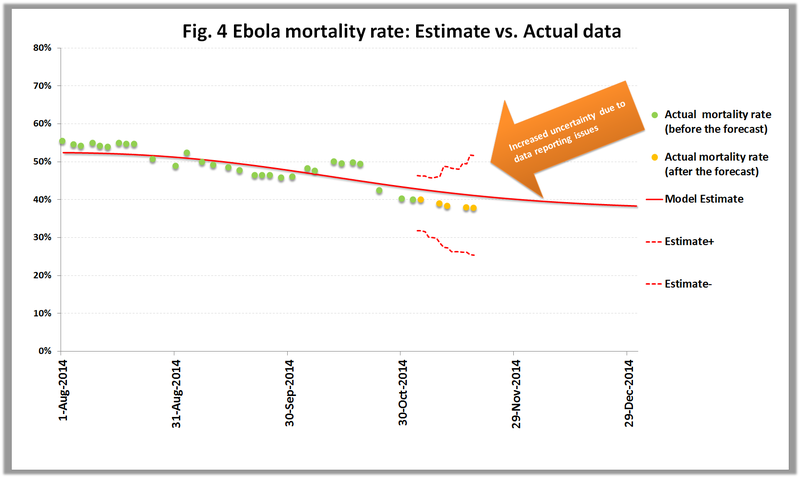 Another discrepancy, indicating that the recent change of data is an effect of poor quality of actual data and not a new trend, is the resulted small mortality rate near 40%, when the average Ebola mortality rate is usually around 50%. The fact that the information we have about this dangerous epidemic is of low quality increases the possible error range of our estimates as we can’t expect the forecast to perform better than the actual data it is based on. 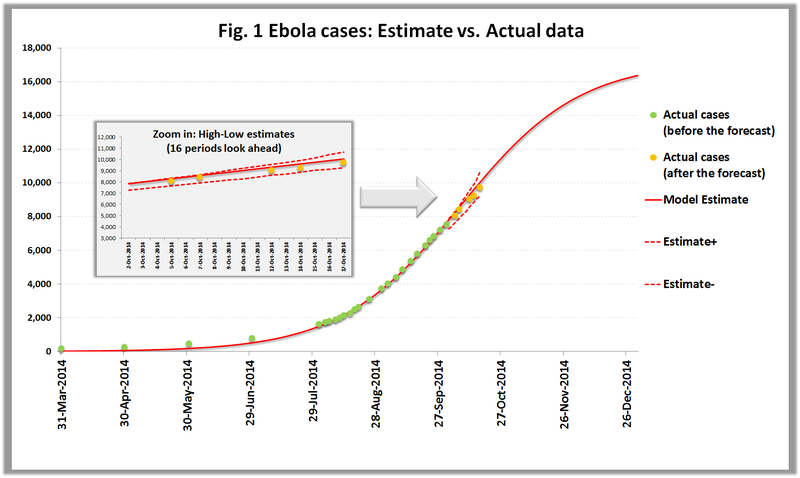 Although, even under these circumstances, the forecasts exhibit a relatively small average error near 10%, this new factor introduces additional uncertainty to our estimates and therefore our strategies to contain the epidemic. 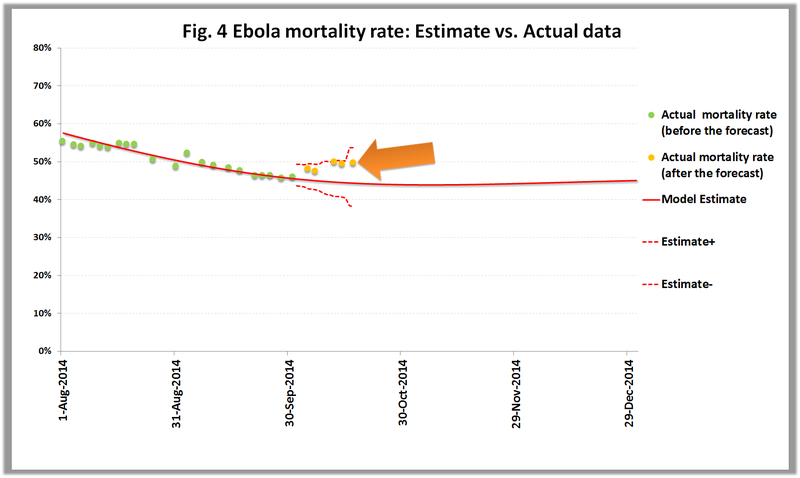 Apart from the reported Ebola cases, a forecast of the expected Ebola deaths and mortality rate has been included, also based on actual data up to Oct 1st 2014. So far, the number of reported cases in October, after the forecast was released, follows the projected trend within the expected error range. That’s no good news as the epidemic still holds strong but no bad news either since at least it doesn’t get any worse than expected. 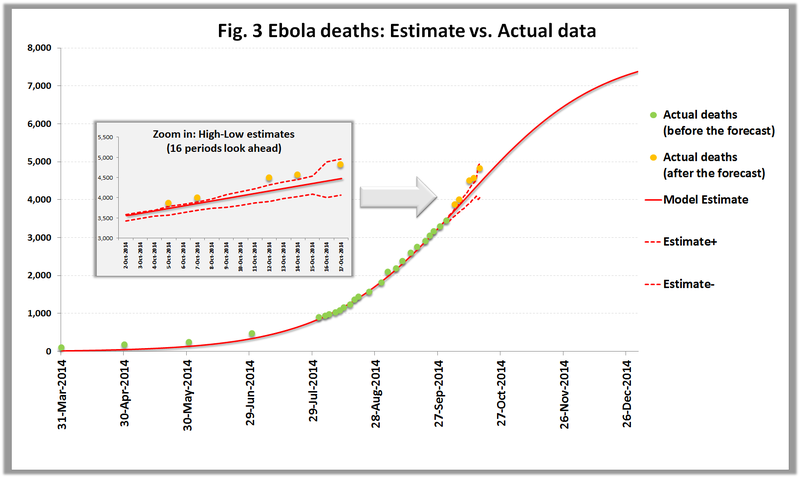 The number of Ebola deaths unveils a similar pattern as reported cases (see Fig.3), being also half way to its completion. If we examine the actual data in October, after the forecast was made, we can see a small upward deviation (see Fig 3., Zoom in window). Although, this is still small, it may indicate a worsening of the mortality rate. Actually, by examining Fig.4 we see exactly this, an initial decline followed by an increase of the mortality rate, now near the upper boundaries of the expected random deviation from the forecast. Obviously, we’ll have to wait a little more to see if this is random or if the trend will permanently move to larger levels than the expected 45% mortality rate. However, this is already a cause for alarm, possibly indicating the lack of appropriate infrastructure for patients’ treatment after being diagnosed with Ebola.